Ian Patrick Scrivens was born in Weymouth on 12 August 1964 but lived in Yeovil where he was a pupil at Westfield School. 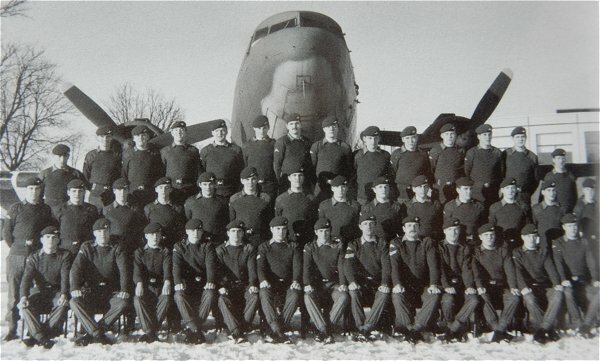 A Junior Parachute Company (JPC) was formed in 1961 as part of The Parachute Regiment and Airborne Forces Depot. The JPC was dedicated to training junior soldiers between the ages of 15 and 17 years and was renowned for its hard physical training, tough discipline, and above all the education of the junior soldier in The Parachute Regiment traditions and ethos. 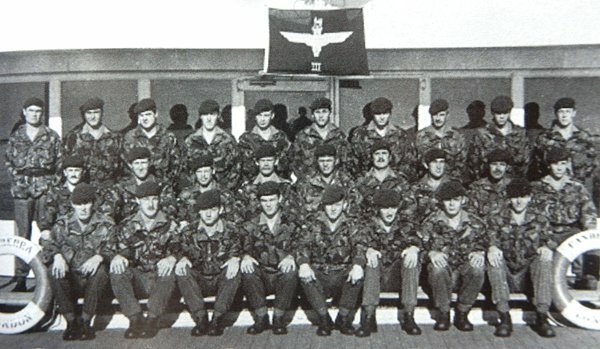 Ian joined the Junior Parachute Company (JPC) in 1981. His parents said ‘He loved every second of it’. He served with the 3rd Battalion The Parachute Regiment (3 PARA) and took part in the Falklands campaign in 1982. 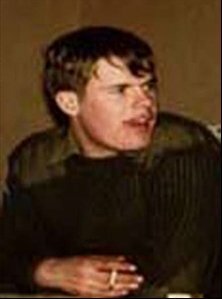 Private Ian Scrivens, aged just 17 years old, died during the Battle for Mount Longdon on 12 June 1982. His friends Neil Grose and Jason Burt were also hit. Neil was mortally wounded and Ian was shot by a sniper trying to save him alongside Private Jason ‘Tommy’ Thomas. Neil had celebrated his 18th birthday only the day before he died and Jason Burt was 17. 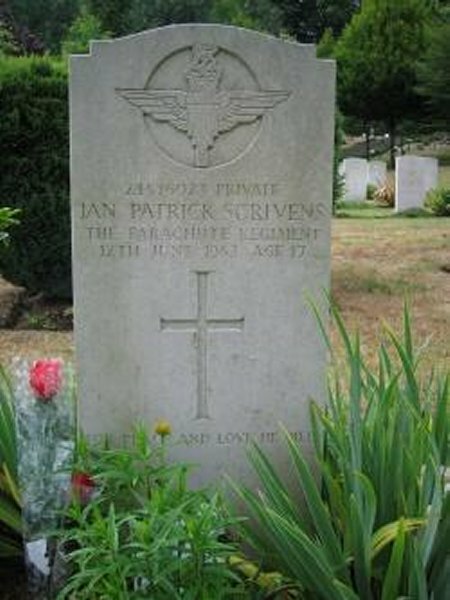 Private Ian Scrivens, the youngest British serviceman to die during the Falklands War, is buried alongside Privates Grose and Burt at Aldershot Military Cemetery, Hampshire. The following account is adapted from "Sod That For A Game Of Soldiers" by Mark Eyles-Thomas (2007, Kenton Publishing). As Mount Longdon loomed out of the darkness, my heart raced and fear set in. Among the rocks on the craggy summit, protected by fortified bunkers, 600 Argentine soldiers were waiting for my battalion to attack. Despite our modern technology and sophisticated weaponry, this battle was going to be men fighting each other face to face, hand to hand, yard by yard. What was I doing in this position, thousands of miles from home and the people I loved? At 17, I wasn’t even old enough to see an X-rated film or buy a drink in my local pub. I had joined the Army after leaving school at 16 as an act of rebellion against my father.... My first year was spent in Junior Parachute Company, which was responsible for training 16-year-old school-leavers. It was tough but I made three firm friends, all the same age as me. Jason Burt, from Walthamstow, was the cockiest cockney you could ever meet. Handsome, with a Mediterranean complexion and the patter to go with it, he was loved by the girls. Ian Scrivens, from Yeovil in Somerset, was a 6ft skinhead who was as hard as iron but would dance like John Travolta to his favourite Motown music. Scrivs was the natural leader, with maturity beyond his years and a presence to match. Neil Grose was the fourth member of our gang, a dark-haired, quiet, dependable lad and a talented marksman. We all won our wings and were sent to 3 Para. Back then, 17-year-olds could join the Army with their parents’ consent – as they can today – but could also fight on the front line, something not now allowed. In 1982, the only restriction was that they could not serve in Northern Ireland. Our battalion was not due to go to Ulster for some time. Seven months later, however, Argentina invaded the Falklands, and within a few days – on April 8, 1982 – we were all on the cruise liner SS Canberra on our way to the South Atlantic. At first we regarded the whole trip as a jolly. A diplomatic agreement would be reached and we would turn around and go home. But the reality of being at war hit home when we learned that HMS Sheffield had been sunk. From then on, we knew we would be landing on the Falklands. On May 21, 3 Para landed unchallenged on Green Two Beach at San Carlos Water on East Falkland and marched 80 miles inland across hostile terrain in atrocious weather. As the Paras pushed forward at breakneck speed, the Argentine conscript army retreated to make their final stand in the horseshoe of mountains surrounding the capital, Port Stanley. On the night of June 11 to 12, the men of 3 Para were given the task of taking the heavily defended, castellated summit of Mount Longdon, which barred the way for the final push to relieve the capital. Longdon lay four miles west of Port Stanley. The height advantage from its summit meant that any attack on the town would be vulnerable from the rear unless the mountain were taken. Intelligence suggested a battalion of Argentine soldiers – about 600 men – from the 7th Mechanised Infantry Regiment occupied a series of fortified bunkers and gun positions among the rocks on the craggy summit. Their morale was expected to be low and resistance weak. We were also assured there were no minefields. With support from Milan missiles and mortars, plus sustained fire from our own machine guns, 3 Para were to attack on foot. To aid surprise, the attack would be silent, which meant Argentine positions would not be bombarded by our artillery. Under cover of darkness, our platoon, 4 Platoon B Company, would advance through the clear ground along the northern edge of the mountain before moving south to a halfway point known as Fly Half. There we would join forces with 5 Platoon and continue the advance towards the summit, codenamed Full Back. Our A Company would attack a smaller summit, known as Wing Forward. Just after midnight we advanced in staggered-file formation. Less than five minutes later there was an explosion followed by screams of pain. My section commander, Corporal Brian Milne, had stepped on an anti-personnel mine. The intelligence had been wrong and the element of surprise eliminated. Immediately, machine-gun tracer rounds rained down on us and flares lit up the sky. I flung myself on the ground. Mount Longdon, previously cold, dark and still, had now come alive. The mountain and our initial objective, Fly Half, were still 100 yards away to my right. Our section, now out in the open land of the minefield, was vulnerable to the enemy’s gunfire. Corporal Milne’s screams reduced to the horrendous groans of a man in serious pain. We lay there in the cold, damp grass taking stock of what was unfolding before us. Lying next to me, my friend Jason Burt turned and said he was going over to Corporal Milne to inject his morphine. Minutes later Jas said: "It hasn’t seemed to ease any of his pain. I’m going to give him mine." As any soldier knows, the single morphine syrette you wear around your neck is for your own use. The way things were going, it was a very brave call to give yours away at such an early stage of the battle. We broke free from our cover and made it to the foot of the mountain to join the rest of our platoon. By now all hell had broken loose above us. Men were shouting "Move left" or "Take out the bunker on the right!" Chaos reigned. Argentinians barked out counter orders, followed by bursts of automatic gunfire, tracer rounds and explosions. Every now and then there came the loud thumping sound of a .50 calibre anti-aircraft machine gun, a huge beast designed to rip aircraft apart in mid-flight. The enemy had found a new target for the weapon: us. We were told to move around the corner of a rock face and form up by a small, rocky ridge. Once in place, the order came to charge head-on towards the enemy’s .50-cal position, a bunker in the rocks just 30 yards away. Men were behind me and to my left, their fixed bayonets glinting in the moonlight. Jas was to my immediate right – all awaiting the order to charge. In the First World War the order was given by the sounding of a whistle, whereupon the lads would run across no-man’s land towards the enemy’s line. More than 60 years later, we were doing basically the same thing – without the whistle. "Charge!" As I cleared the ridge and ran towards the enemy’s position, firing my weapon, I thought of nothing. No doubt, no fear. It was robotic. As I crossed the ground in front of their position, they fired at me. I continued to charge, unstoppable, unperturbed by the pounding gun. Taking cover behind a clump of rocks, I looked back through the dark over the ground I had run across. There was most of the platoon, wounded, taking cover or lying motionless. I considered breaking cover and vaguely remembered Jas, who was to my right, going to ground mid-charge. "Jas?" I called out. Nothing came back. "Tom, is that you?" a voice asked. Tom was my nickname. "Is that you, Scrivs?" I said. "Yeah, I’m over here with Grose, he’s been shot." I crawled back to look for Jas and spotted him lying face-down about 30ft from where I had taken cover. I called to him but he didn’t answer. As I drew nearer I feared the worst. "Jas?" I said, hoping he would answer. Again nothing. Grabbing his smock, I turned him over to face me. Jas’s body slumped unnaturally towards me and one of his arms fell to his side. A round from the .50-cal machine gun had penetrated his head, killing him instantly. Then I crawled over to Scrivs, who was with Grose in the middle of the battlefield. "I think he’s been shot in the chest," said Scrivs. "But I can’t find the exit wound." Each time a shot rang out, Scrivs would lie over Grose to protect him. "That poxy sniper has been shooting at us all the time we’ve been here," he complained. "How’s Jas?" I slowly shook my head. Scrivs closed his eyes for a second in acknowledgement. I was grateful for his simple expression of sympathy. His mental strength, just like his physical, was always evident. With the enemy gun position now silent, we could hear other injured members of the platoon groaning and calling for assistance. We removed Grose’s webbing and I checked the dressing on his chest wound was firmly sealed around its edges. Grose was in pain and struggling to breathe. "Let’s get him on to his injured side," I said. Grose screamed in discomfort and begged us not to move him. With a wound to the chest the lungs could fill up and Grose might have drowned in his own blood. He had to be placed on his injured side so any internal fluids could drain, or flow into his damaged lung, leaving his uninjured lung to function. "Grose, you must move on to your injured side," I said, trying once more to reposition him. "Don’t move me, don’t move me!" he screamed. I gave in. Other members of B Company were now attending to the platoon injured. "How’re you enjoying your birthday party, mate?" Scrivs jokingly quizzed Grose. "You certainly know how to have a do. I think the neighbours will be upset with the noise, though." Grose tried to laugh but the pain was too much. "Don’t make me laugh," he pleaded. "We’re going to have to move him," I said to Scrivs. "We can’t stay here out in the open." I placed my hand on Scrivs’ shoulder to beckon his head nearer to mine. At that very moment a single shot rang out. Scrivs fell across my lap and fluid splattered on my face. I pushed Scrivs off me with an instinctive and repulsive jerk. He lay motionless in a limp, crumpled heap. I sat there not believing what had happened. One minute I was talking to Scrivs with my hand on his shoulder, the next – ZAP – he was gone. A shudder went up my spine. When was it going to end? Everywhere I looked, soldiers lay wounded. I thought, I’m not going to make this. Then Grose looked at me. "Where’s Scrivs?" I didn’t want to tell him but he could see it in my eyes. Grose screwed up his eyes, this time in the pain of losing a friend, and tears fell. I cried too. 476 Platoon's passing out photograph. Ian Scrivens is front row, second from left. 4 Platoon, 3 Para on board HMS Canberra. Ian Scrivens is front row, far left. Neil Grose is back row third from left, Jason Burt is back row sixth from left and Mark Eyles-Thomas is back row, seventh from left. Ian's headstone at Aldershot Military Cemetery, Hampshire.